*Beinhaltet alle herunterladbaren Inhalte für Borderlands 2 und Borderlands: The Pre-Sequel ab dem 31. Dezember 2017. © 2009 - 2019 Gearbox Software, LLC. Published and distributed by 2K. Gearbox Software, Borderlands, and the Gearbox and Borderlands logos are trademarks of Gearbox Software, LLC. 2K and the 2K logo are trademarks of 2K in the US and/or other countries. Unreal, the circle-U logo and the Powered by Unreal Technology logo are trademarks or registered trademarks of Epic Games, Inc. in the United States and elsewhere. NVIDIA and the NVIDIA logo and The Way It's Meant To Be Played are trademarks and/or registered trademarks of NVIDIA Corporation. This software product includes Autodesk® Scaleform® software. © 2017 Autodesk, Inc. Autodesk and Scaleform are registered trademarks or trademarks of Autodesk, Inc. and/or its subsidiaries and/or affiliates in the USA and/or other countries. Powered by Wwise (ce) 2006 - 2017 Audiokinetic Inc. All rights reserved. 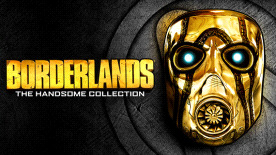 Includes all available downloadable content for Borderlands 2 and Borderlands: The Pre-Sequel as of December 31st, 2017.